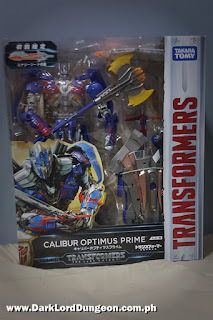 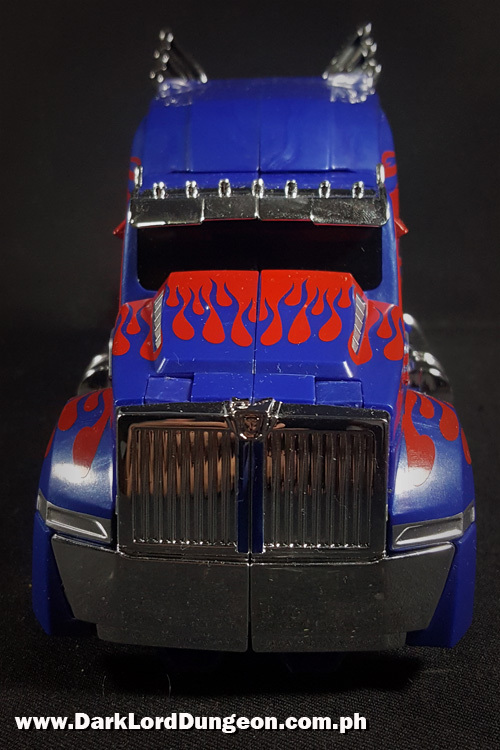 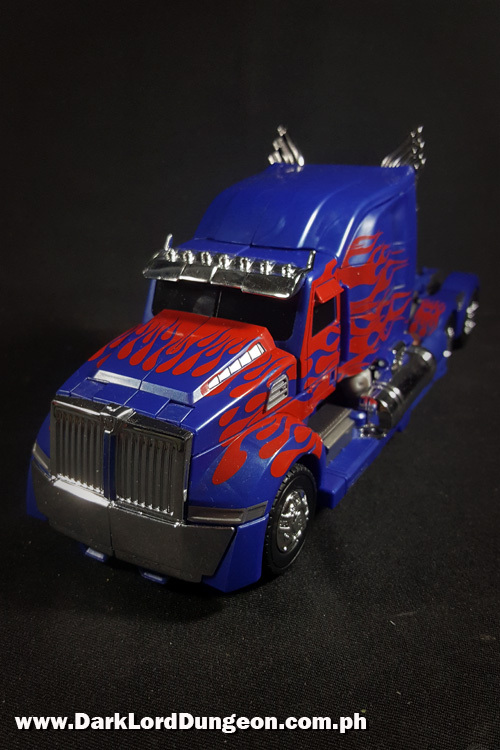 The Transformers TLK-15 Calibur Optimus Prime's blister pack reads: "When Legends face to each other, as is often the case, the field will suddenly turn into an insane battleground. 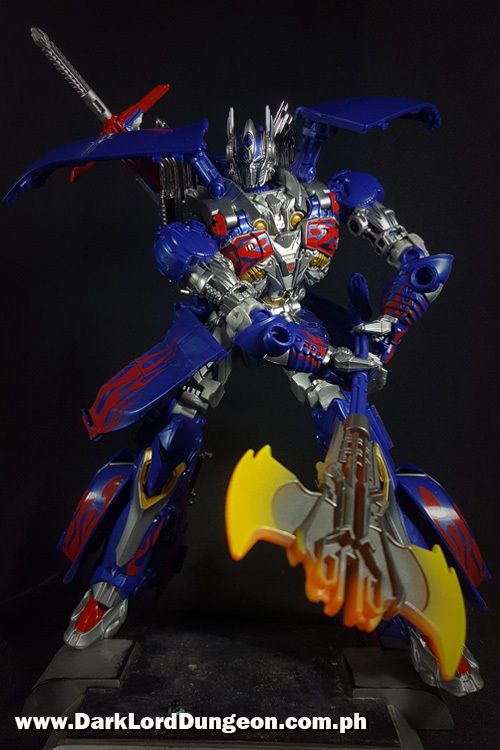 Fire power has no meaning, but only their savage physical strength counts. Calibur Optimus Prime is one of the most adjusted close-combat style shape to survive this insanity"
That probably sounds better in Japanese. 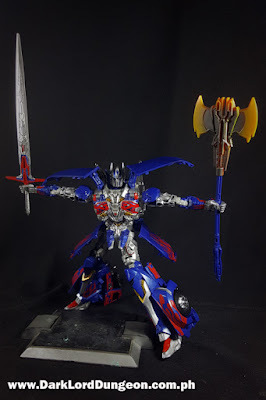 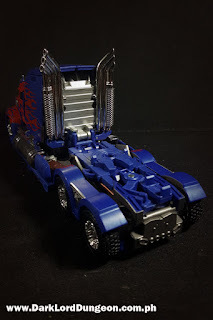 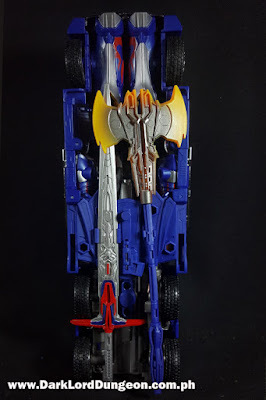 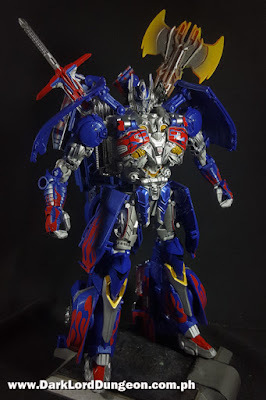 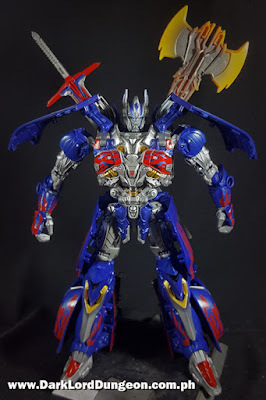 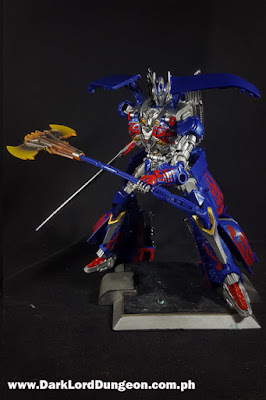 Further, instead of a gaily colored version of the movie sword and shield that accompanies the Takara Armor Knight Optimus Prime, the Takara TLK-15 Calibur Optimus Prime comes with a more movie-accurate sword, an axe that doesn't appear in the movies, a more traditional movie sword that is actually meant for the Masterpiece Movie Prime, and; his rear-end that changes into a shield. 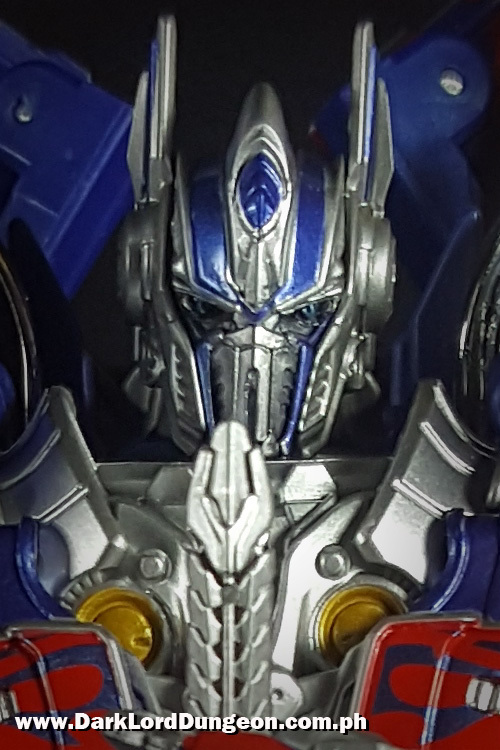 I am Optimus Prime.... KNEEL BEFORE ME!!!!! 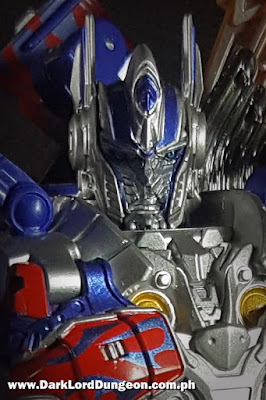 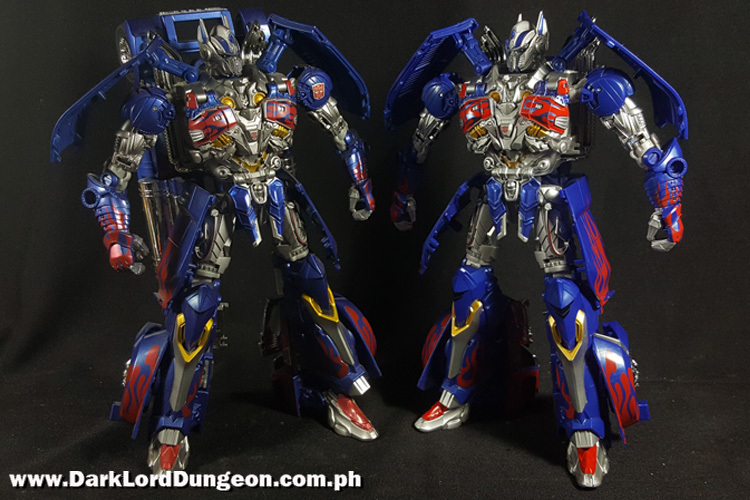 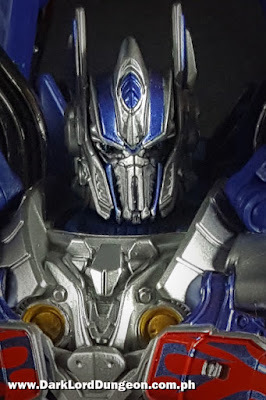 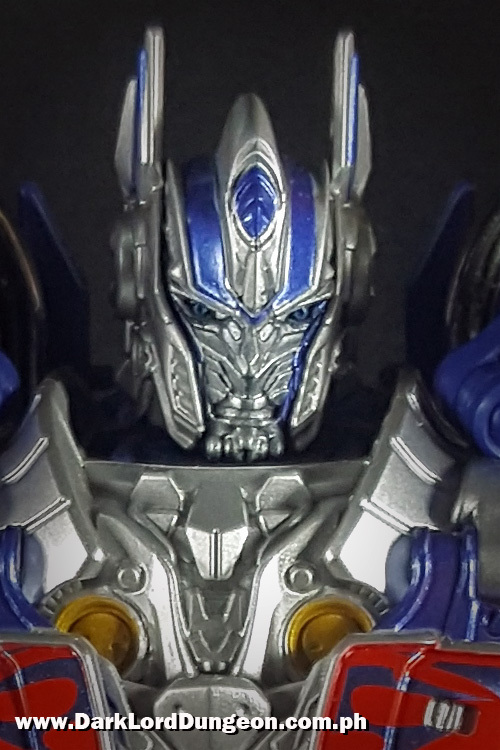 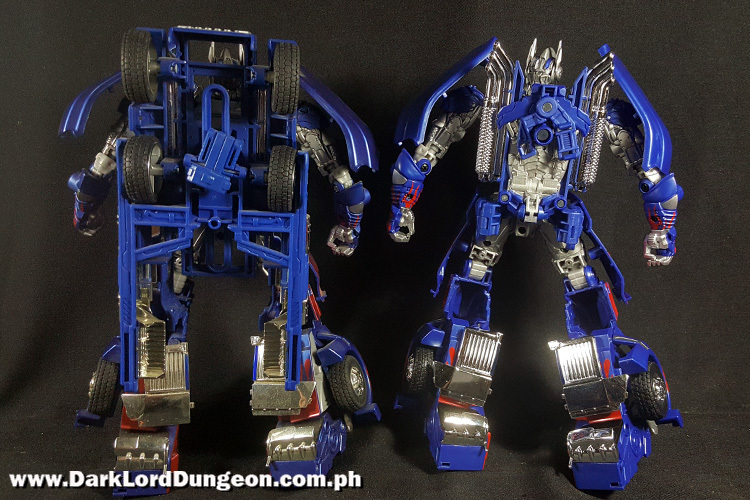 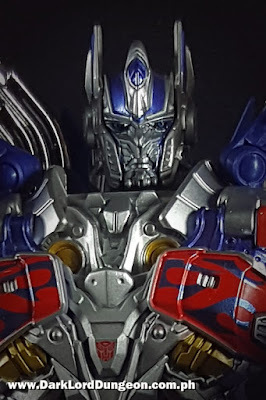 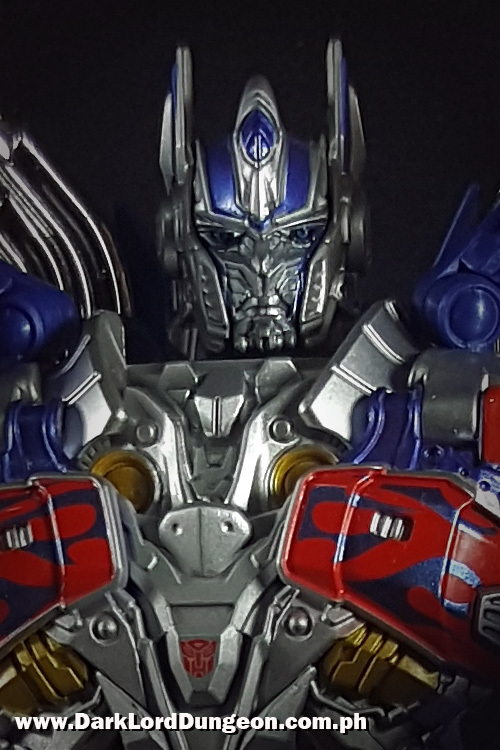 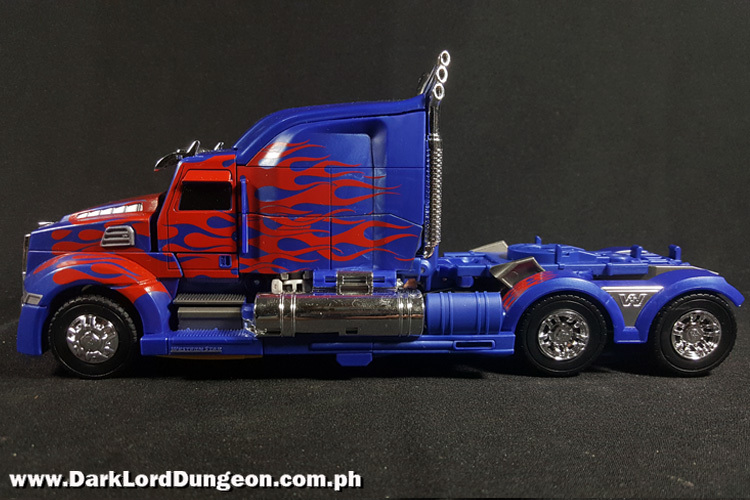 WHAT'S TO LIKE ABOUT THE TAKARA TLK-15 CALIBUR OPTIMUS PRIME? 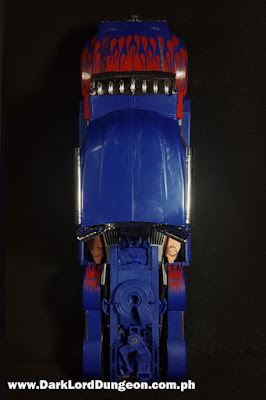 FIRST: Back - more of a two lifetimes ago - when we read the Iliad, we noted how Homer liked to describe shields - the more insanely intricate, the better for Homer. 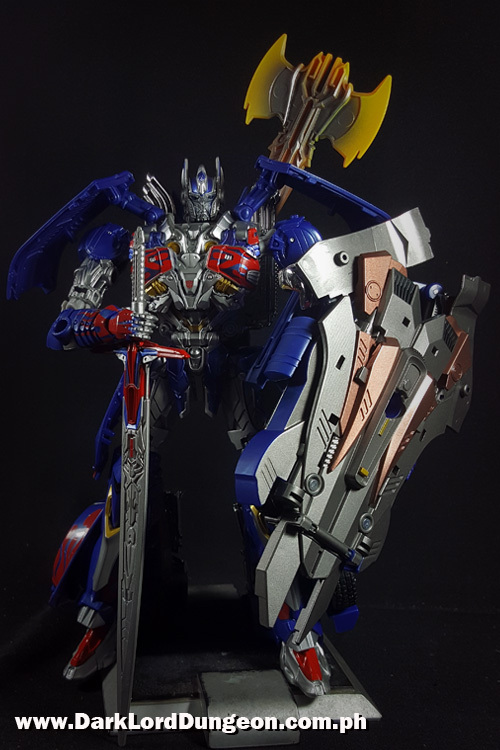 He also liked to describe how thick they were - which is really hard to fathom thanks to how thin those bronze shields used in Hollywood tend to be. 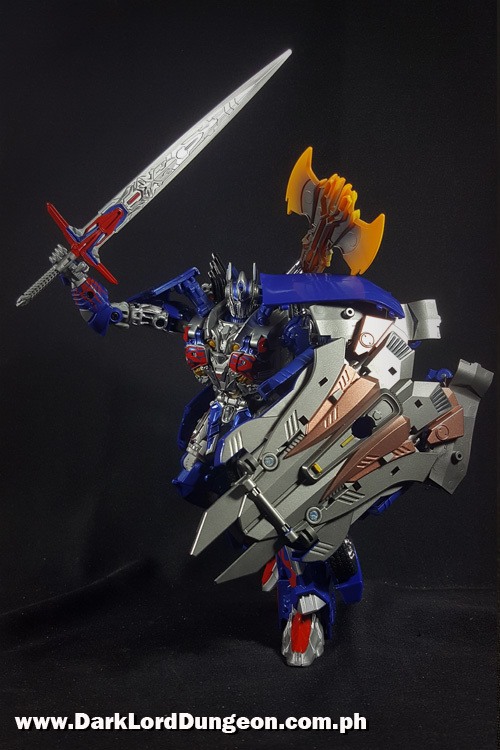 Our favorite was that of the mighty Ajax, whose shield was described as "a shield of bronze with seven folds of ox-hide—the work of Tykhios, who lived in Hyle and was by far the best worker in leather. 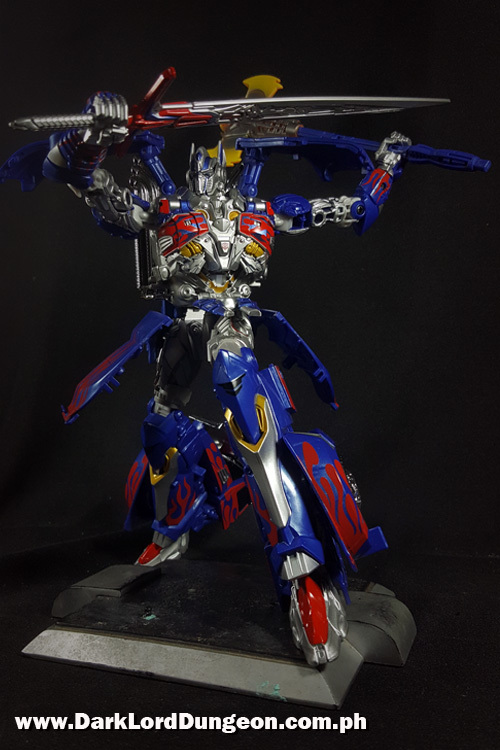 He had made it with the hides of seven full-fed bulls, and over these he had set an eighth layer of bronze." 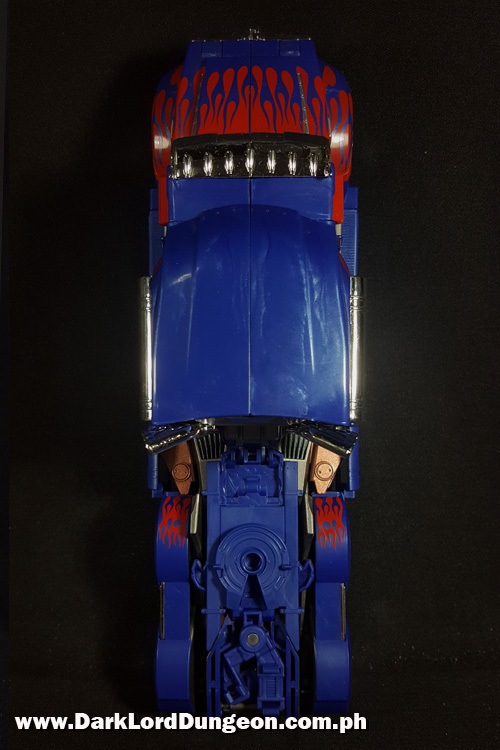 And we remember wondering in class just how thick that was. The nice part is that - while it may make Calibur Prime top heavy, tends to keep falling off and is in general unwieldy - because of Calibur Prime's ratcheted arms, he can actually support and use the shield (Within limits). 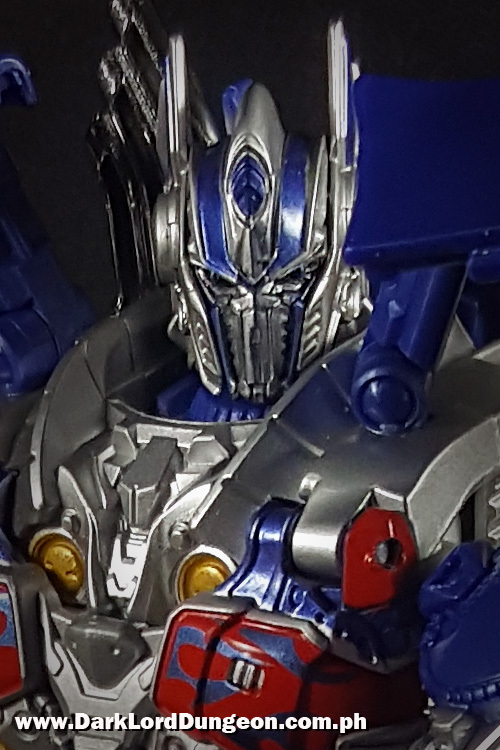 SECOND: As with the Takara Armor Knight Optimus Prime, we love the detailing that went into the creation of the Calibur Prime, especially the detailing that went into his face - which retains Armor Prime's face switching ability (Mask on, mask off). 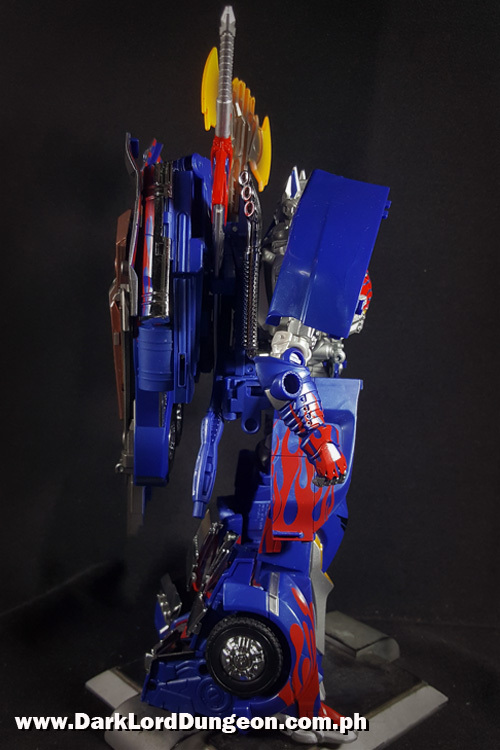 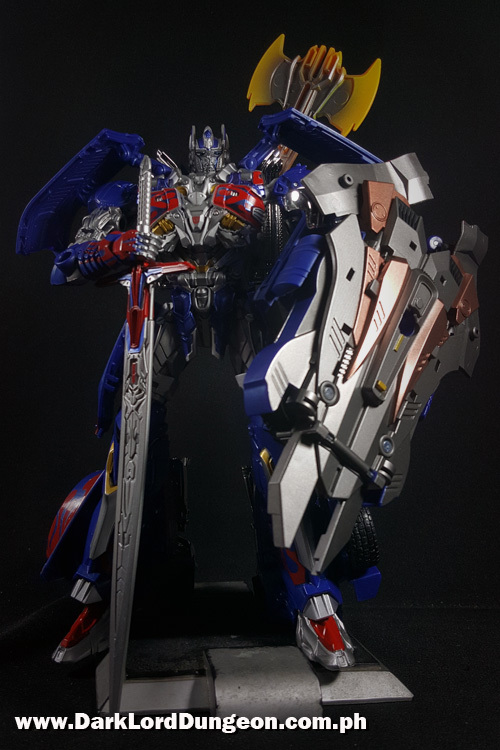 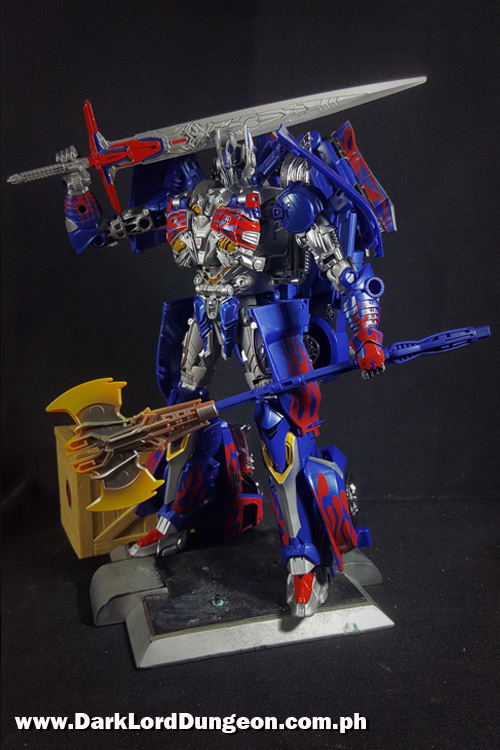 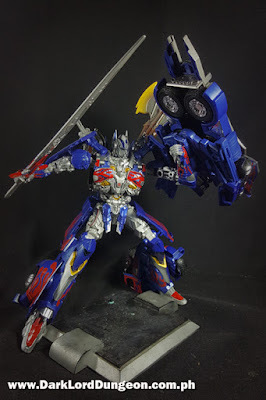 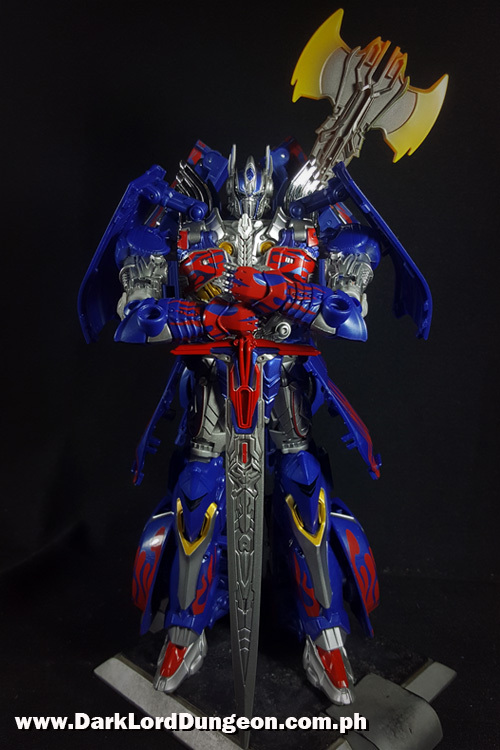 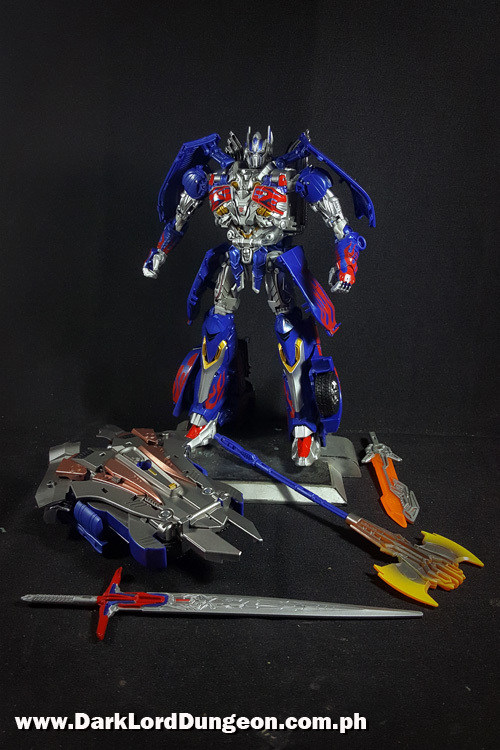 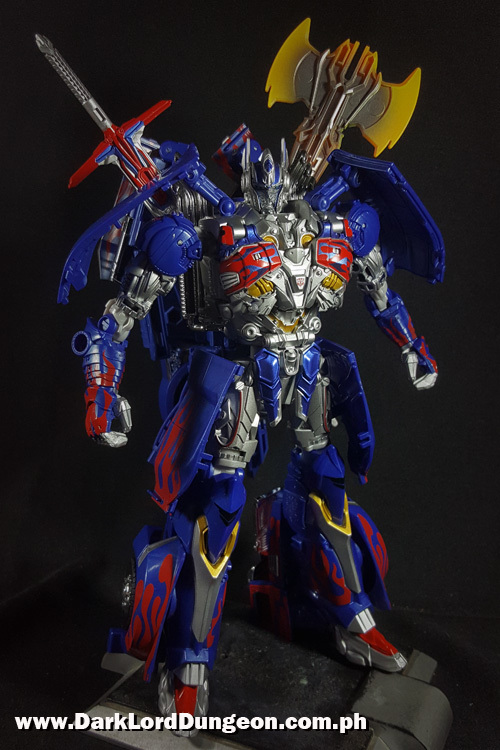 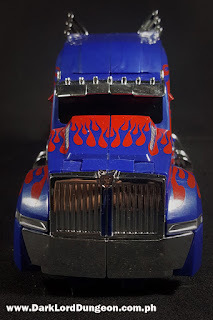 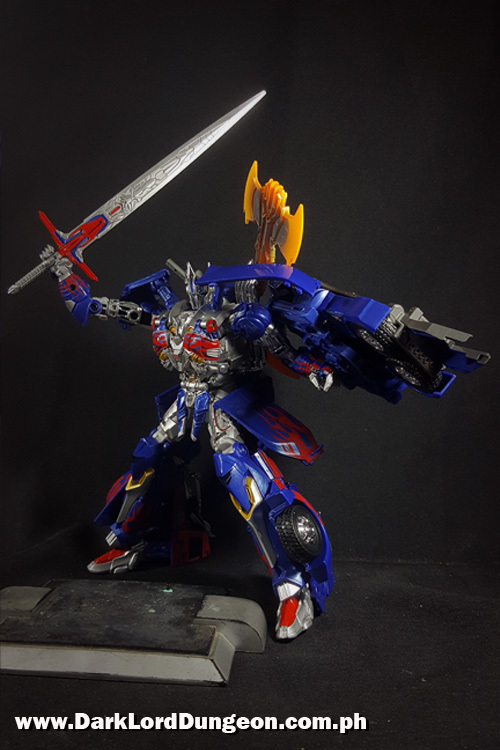 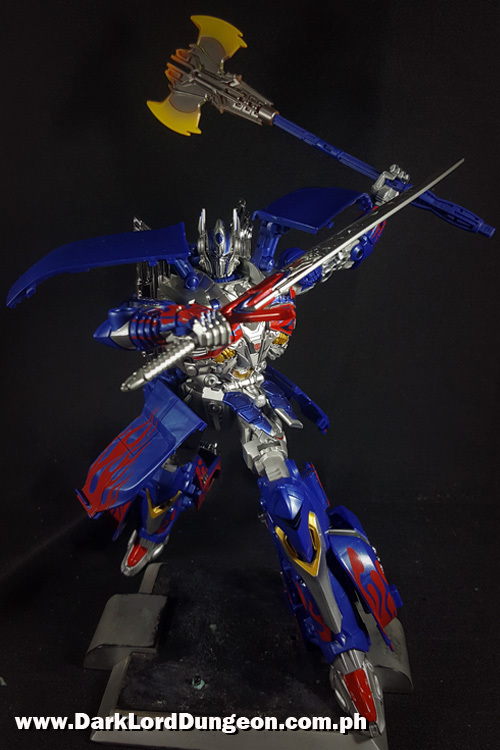 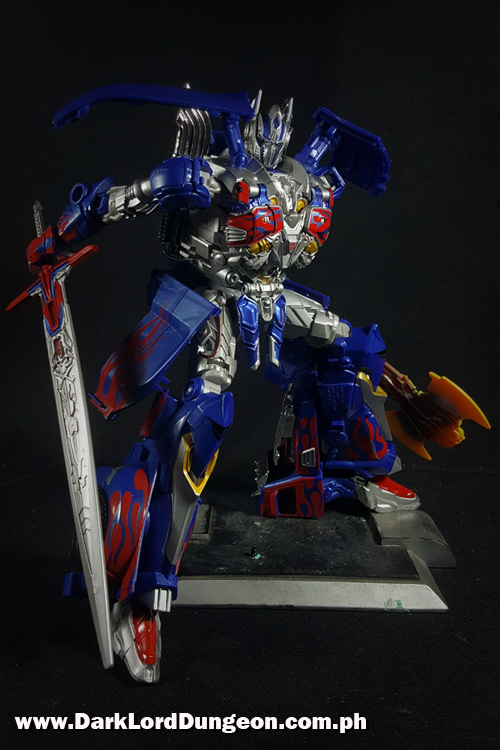 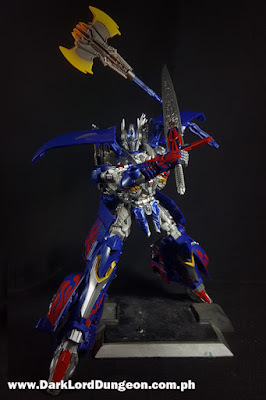 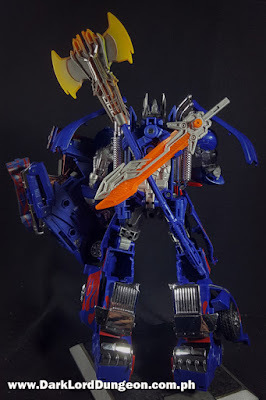 THIRD: The Calibur Optimus Prime can carry all his weapons - including the little sword that was not meant for him but rather meant for the Movie Masterpiece Optimus Prime. 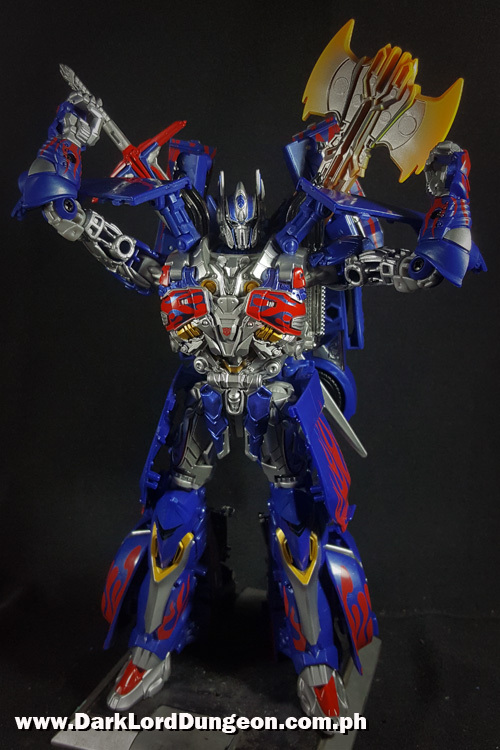 Here he is without the shield. 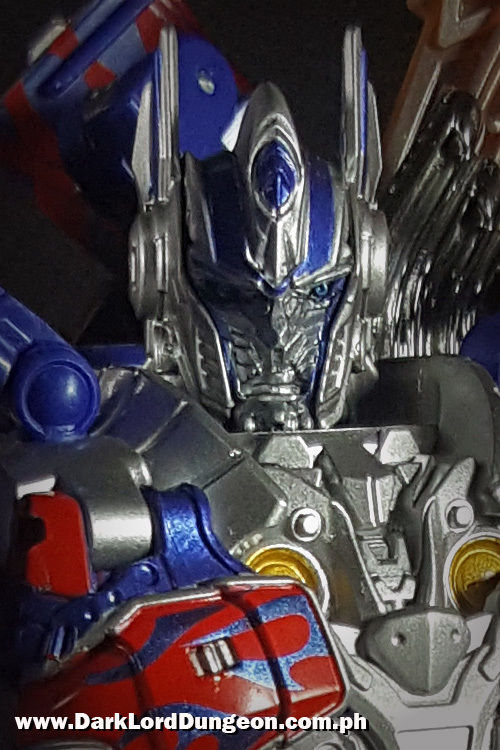 Note the gaping holes behind his knees. 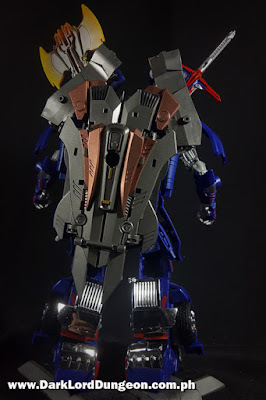 We didn't notice that with the Takara Armor Knight Optimus Prime because of the shell-forming back-pack, but apparently it's there too. 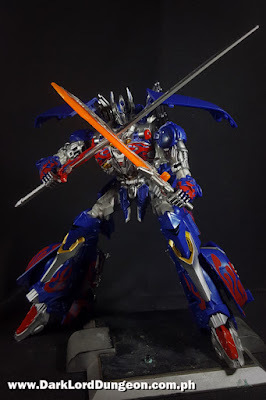 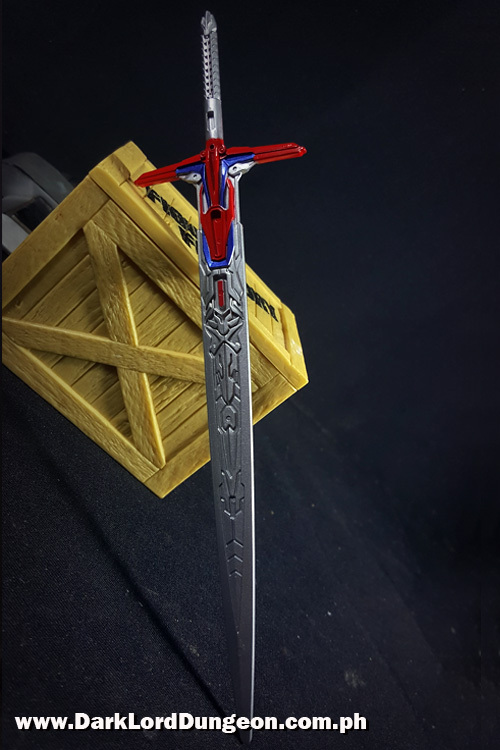 FOURTH: The Calibur Optimus Prime's sword is a work of art. 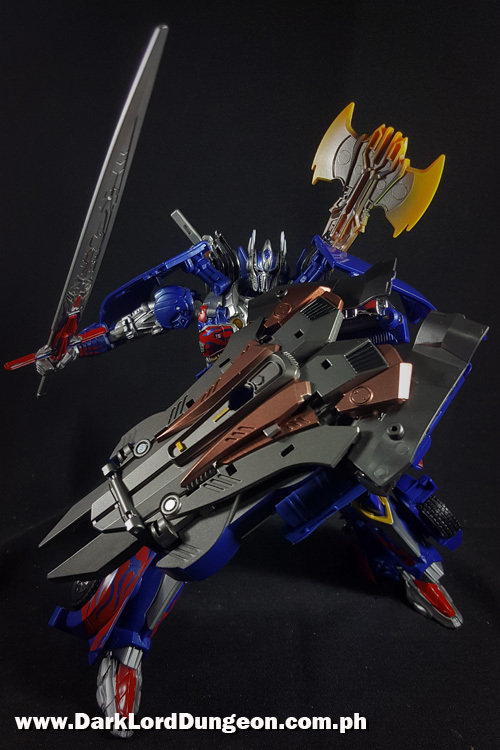 It's simply beautiful and we're glad that, again, Takara seems to have noted how collectors preferred the 3rd party realistic swords over those tackily-colored children's toys that they issued in the past. 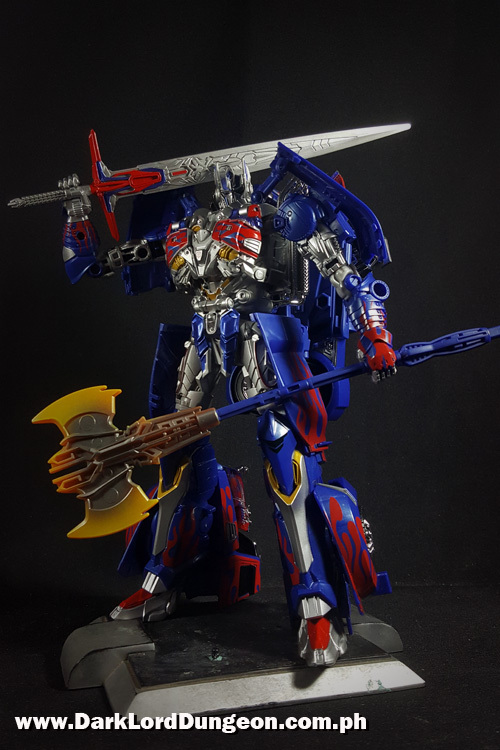 But we do have to note that Prime's axe is... still tackily colored. FIFTH: As with the Takara Armor Knight Optimus Prime, the articulation of the Calibur Optimus Prime's excellent. 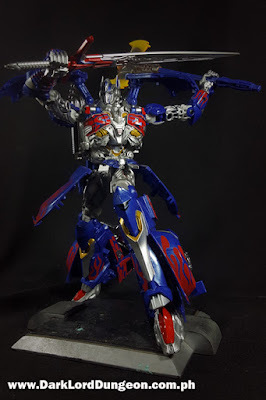 He still can't kneel, but he can be made to pose quite nicely. 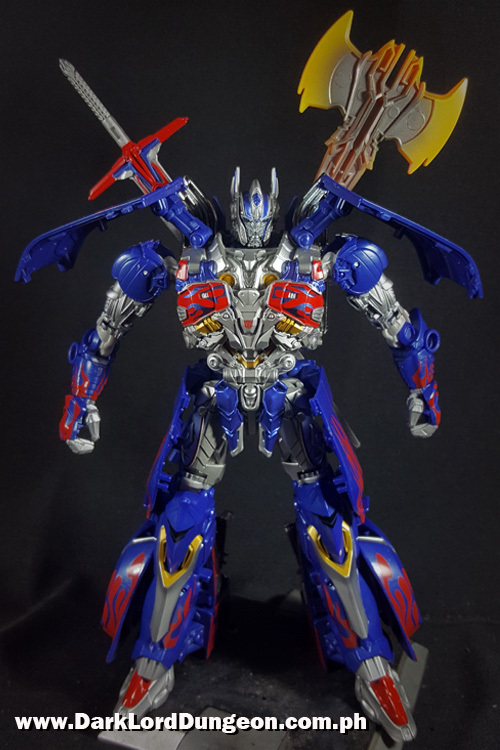 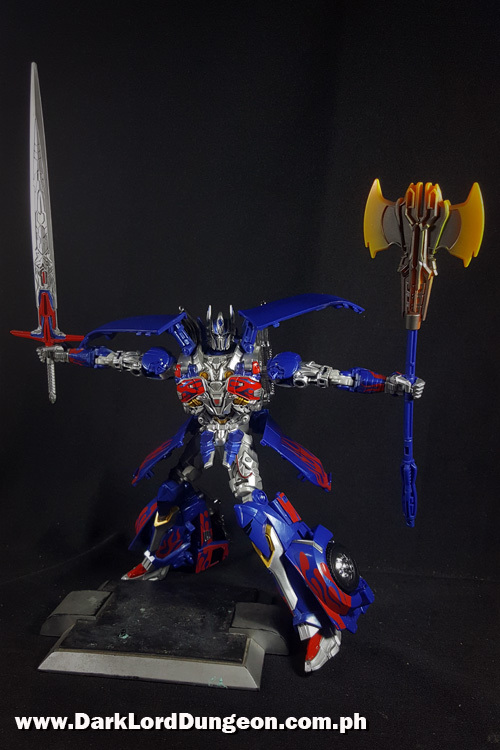 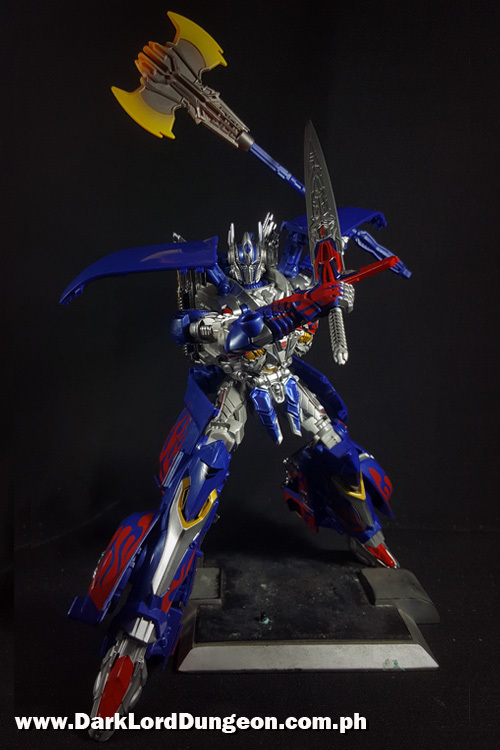 As with the Takara Armor Knight Optimus Prime, Calibur Prime can dual wield his sword. 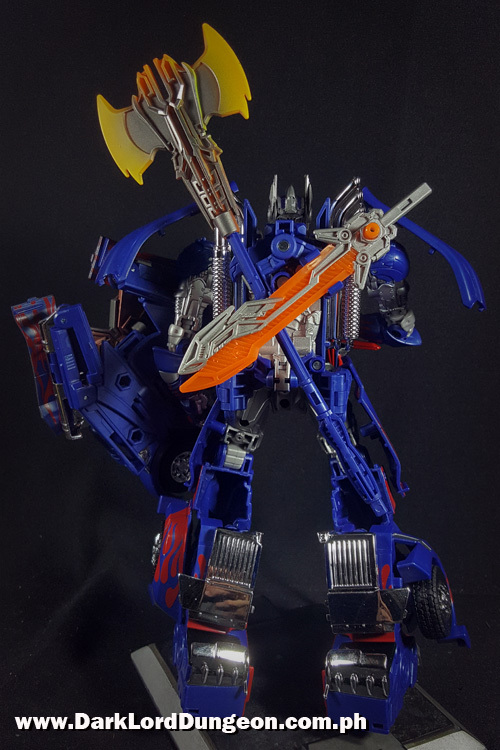 Not someone you want to meet on the battlefield. 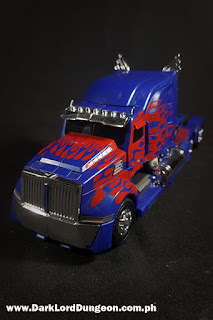 Note the shiny Western Star Logo on the side. WHAT'S NOT TO LIKE ABOUT THE TAKARA TLK-15 CALIBUR OPTIMUS PRIME? 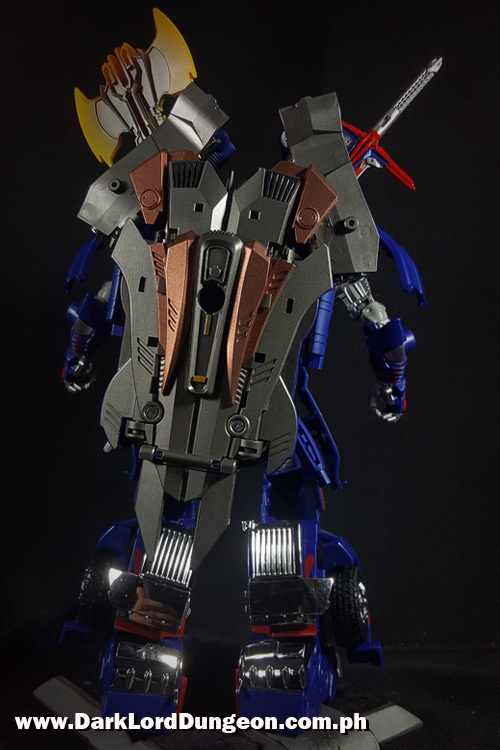 FIRST: The reason why we never bothered removing the shell-forming backpack off our Primes is that his waist is really thin. 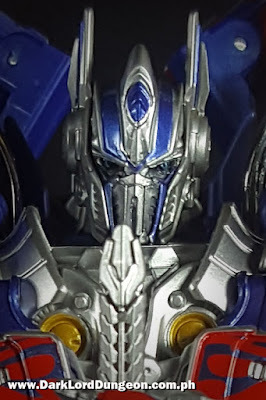 This is more of a nitpick from us that Takara didn't address this. 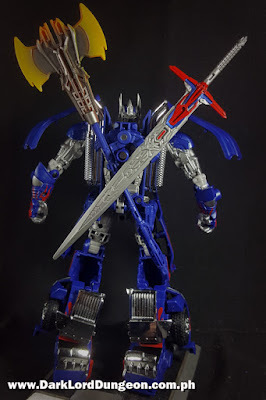 SECOND: Despite the heightened articulation thanks to the loss of his shell-forming backpack, Calibur Optimus Prime still cannot reach all the way back there to get either his sword or shield. His huge shoulder pauldrons simply won't allow it. THIRD: Takara provided for the storage of Calibur Prime's weapons underneath his chassis in his truck mode. 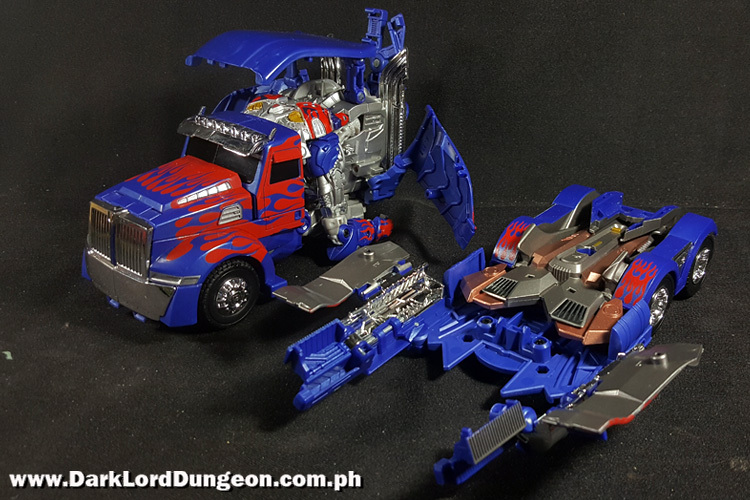 However they're so low that they scrape the ground and hamper any true movement. 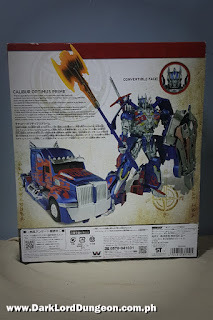 The Takara Calibur Optimus Prime is available on Amazon for US$ 73.99 (Roughly PhP 3,773 plus shipping).